It’s been a hectic week but I have finally found some time to write some thoughts on the weekend in Dublin. Ireland’s capital is one of my favourite cities to visit with everyone so friendly and welcoming, but I did detect an air of confidence in the Irish that their team would be able to overcome England in the Sunday game. First of all we needed to find somewhere to watch the Saturday Six Nations games and so we met up with friends from Commons & Lords RFC in the Oval Bar off O’Connell Street. Despite a couple of the C&L team being Scottish I was delighted for Italy that they won their game and playing away from home at that. The Italian supporters are passionate about rugby and are always so despondent when they go through a Six Nations without a victory, but the win will give them and the game in Italy a huge boost. During the France v Wales game it was interesting that the Irish in the bar were split 50/50 in their support for the two countries. After the games it was time to resume the pursuit of Guinness, so after visiting McDaid’s and Bruxelles we settled ourselves in the Bank on College Green, a beautifully decorated bar that has reminders of its financial past all around. Friends from Clacton and Brightlingsea Rugby Clubs joined us and the rest of the evening is a bit of a haze. Match day dawned and after a quiet morning we got on the coach to take us to the Aviva stadium. The sky was grey and overcast but everyone was surprised when it started to snow! However the hospitality of the Irish was very generous and the Guinness flowed once more before lunch but it was soon time for kick off. 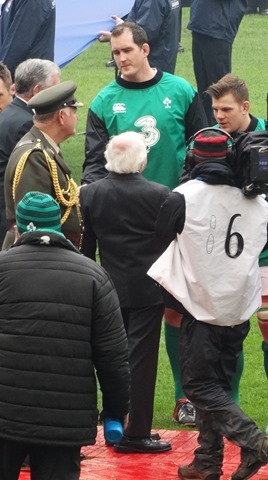 The teams were presented to the Irish President who is a tiny man and I had to chuckle when he shook hands with the 6’10” lock Toner; he just about came up to his chest. 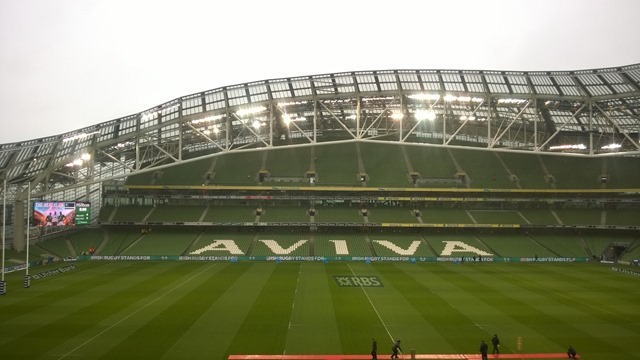 As for the game, my view is that the Irish had a game plan to beat England and executed it perfectly, with Murray and Sexton’s aerial bombardment coupled with great chasing keeping England on the back foot. I thought it was telling that when Sexton was forced to go off England started to gain the advantage, and when the Ireland tight head was substituted the England pack started to dominate. Clearly, strength in depth is an issue for the Irish and when it comes to the World Cup this could prove crucial. I think it is likely that England and Ireland will meet in the semi-final and it will the the team that has the least injuries that will prevail. That is why I don’t see the result as a disaster, more an opportunity to learn from mistakes and recognise just how many good players England can call upon. At the post match dinner Nick Easter was presented with an award to recognise his fiftieth cap and after the formalities were over I left to meet up with one of my oldest friends for a catch up, visiting Neary’s and O’Donohue’s before talking into the small hours with the help of Guinness and Jamieson’s at the Westbury. Another memorable weekend in Dublin. Postscript: I am surprised that the rugby press is firmly of the opinion that Wales will beat Ireland on Saturday. Wales’ performances haven’t set the world alight so far while Ireland have kept to a simple game plan and executed it well. If I was allowed to bet on rugby (which I’m not) I would but my money on an Irish Grand Slam.